Arteries And Veins: What is The Difference? Most non-medical people don’t know the difference between an artery and a vein, and the confusion is quite understandable. The truth is, arteries and veins connect to each other and are part of a circuit that transports blood from the heart to the rest of the body (arteries) and back to the heart again (veins). Arteries are the tubes that contain freshly oxygenated blood pumped from the heart to the body, and veins are the tubes that transport the blood back to the heart. Between the two are tiny little branches that form a mesh network of blood vessels (called capillary beds) with delicate little walls that allow oxygen and nutrients to be transported across them and into the cells nearby. Arteries and veins have important differences in their wall structures. Arteries have to be tough and strong to withstand the high pressure of the heart’s pump. Their walls are muscular and thick, and don’t allow things to pass through. Over time, arteries can “harden” and develop deposits of cholesterol and calcium in their walls. If they become too narrow, or if the deposits tear off and form a clot, the tissue they supply downstream can have its oxygen supply suddenly stopped. This results in the potential for that tissue to suffocate and die. If the tissue downstream from the clot or artery narrowing is brain, the result is a stroke, if the tissue is heart muscle, the result is a heart attack. Any tissue can be affected (including the eyes, lungs, and limbs) by artery narrowing or clot formation, but brain and heart damage occur most commonly. It’s important to recognize heart attack and stroke symptoms right away because doctors can often remove clots with medicines (kind of like Drain-O) or open the arteries back up with small surgical procedures (like a Roto-Rooter) before the downstream tissue outright dies. It breaks my heart when I hear patients tell me that they were having chest pain or sudden weakness of half of their body so they decided “to lie down and rest” in the hope that it would go away. Unfortunately, if the blood supply is not restored to the brain or heart within 6 hours, the cells will die and recovery is severely limited. While my patients were “resting” they were allowing their brain or heart tissue to suffocate. So please don’t be like them – get medical help immediately if you have symptoms of a stroke or heart attack. As far as veins are concerned, they are a collecting system for the blood returning to the heart from the capillary beds. Their walls don’t have to be tough, they are soft and collapsible. The blood pressure in veins is so low that they have little valves in them that help to prevent blood from pooling in the feet, for example. When nearby muscles contract, they tend to compress the veins and “milk” the blood back towards the heart. When the blood passes a valve, it flops closed so the fluid can’t slide backwards. For this reason, inactivity can cause swelling in the legs. When calf muscles are not working, squeezing the veins and passively milking the blood back to the heart, the blood tends to pool in the legs (especially if they are dangling – gravity contributes) and the higher pressure allows the water portion of the liquid blood to leak out of the veins and capillaries and puff up the skin and surrounding tissues. 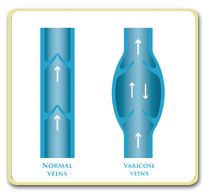 Some people are born with faulty valves in their veins, and this can contribute to “varicose vein” problems. Veins with herniated walls look lumpy and can be seen through the skin. Superficial veins can be surgically removed (sclerotherapy) to improve the cosmetic appearance, and the blood simply returns to the heart through veins that are deeper in the muscle and not visible from the surface. Veins can also develop clots when the blood is not moving through them fast enough (it congeals). When clots develop in the large veins of the legs, they are called DVTs (or deep vein thrombosis) or VTEs (venous thrombo-embolism). These clots are dangerous because they can break free from the leg vein and travel in the bloodstream back to the heart and get pumped into the lungs. When a clot is stuck in a lung, it cuts off the blood supply and that part of the lung will permanently die unless the clot is removed right away. In rare cases, people who have a small heart defect can get a stroke from leg vein clots traveling through the heart to the brain. So as you can see, both arteries and veins are important blood transport tubes that can cause a lot of trouble if they are narrowed or clotted off. What can you do to keep your arteries and veins in good health? Exercise – regular exercise is the very best way to keep your muscular arteries and your floppy veins moving blood through the system. I think of exercise as kind of a natural flushing mechanism for the arteries and veins. You wouldn’t want to leave your toilet unflushed for more than a day or two, and neither should you go very long without exercise! The optimal amount of exercise depends on your medical status, but for most Americans, 30-60 minutes of moderate-intensity exercise (five days per week) or 20-60 minutes of vigorous-intensity exercise (three days per week) is recommended. Remember, walking is great exercise because the calf muscles will naturally milk the leg blood back to the heart! Maintain a healthy weight – as you can imagine, having extra fat makes the heart work harder to push blood through that tissue. Veins may be compressed by extra body fat and have a hard time getting blood back to the heart, causing swelling and water weight gain, and even skin break down. Get your cholesterol checked – cholesterol can build up in the artery walls over time, making them narrower, and creating plaque that can break off and cause heart attacks and strokes. How your body processes cholesterol is determined by your genetics, so there are some people who really can’t control their cholesterol with a healthy diet alone. Your doctor will let you know if you should take a cholesterol-lowering medication. Don’t take high doses of calcium supplements – we have recently discovered that calcium pills may do more harm than good for some (especially older) people. Although calcium is important for maintaining strong bones, too much of it can cause the body to store it in the artery walls! It’s much safer to get your calcium from food sources, so if you’re supplementing your diet with calcium pills, ask your doctor if the benefits outweigh the potential risks for you. Take blood clots seriously – if you have a swollen, tender calf and a sedentary lifestyle, check with your doctor to see if you should be tested for DVTs. Once diagnosed with a blood clot in your leg, be very vigilant to take your clot busting (or blood thinning) medicines as directed. You do not want the clot to travel to your lungs (called a pulmonary embolism). Treat your auto–immune disease – some people have auto-immune reactions that involve their blood vessels. Inflammation of the blood vessels puts them at a high risk for clots, and so it’s especially important for people with vasculitis to follow their doctor’s medical advice and take medicines on time. In my next health tip, I’ll discuss a common problem: leg swelling. A patient of mine recently asked me what could cause swollen legs, and it made for a good discussion. You have learned some of the potential causes in this review (clots, vein insufficiency, inactivity, gravity) but there are quite a few more that I think you’ll find interesting.